I need to let you in on a secret, one that you will likely be glad to know before Xmas (or more precisely, before you have tipped off Santa about which handbag you are secretly coveting this year). Forget about all the mainstream designer brands (been there, done that and seen it everywhere). What you actually want and need is a Kalamarie, a new, uber chic, sophisticated, luxury brand that has been reserved to a happy few until now but which is gradually becoming the talk of the town. I was lucky enough to stumble upon Kalamarie six months ago as I was randomly going through instagram (now I know why we live in this crazy social media world!). Their quirky chic handbags were basically screaming my name and I instantly fell under the spell of this Colombian brand. Entering the world of Kalamarie is like stepping into a candy shop, everything is simply irresistible: handpicked, homemade, 'carefully sourced, lovingly treated, masterfully crafted' candies. And so I had to have a bite at some South American caramel. Remember that gorgeous cognac saddle bag I was wearing in a recent post (The Navy Blazer 8/11)? That's a Kalamarie. Josephine Saddle Bag sold out in Cognac but still available in grey or burgundy at 60% off (£260). What was I saying about candies again? You could almost imagine this bag hanging from a Xmas tree, right? Concentrated beauty and perfection and burgundy velvet is so on point. So perfect actually that this bag sold out within days of its release in NY so its launch in the UK has been delayed. But it can be pre-ordered on line here. Wearing Ba&sh jumpsuit (combinaison Mosetta, £280). 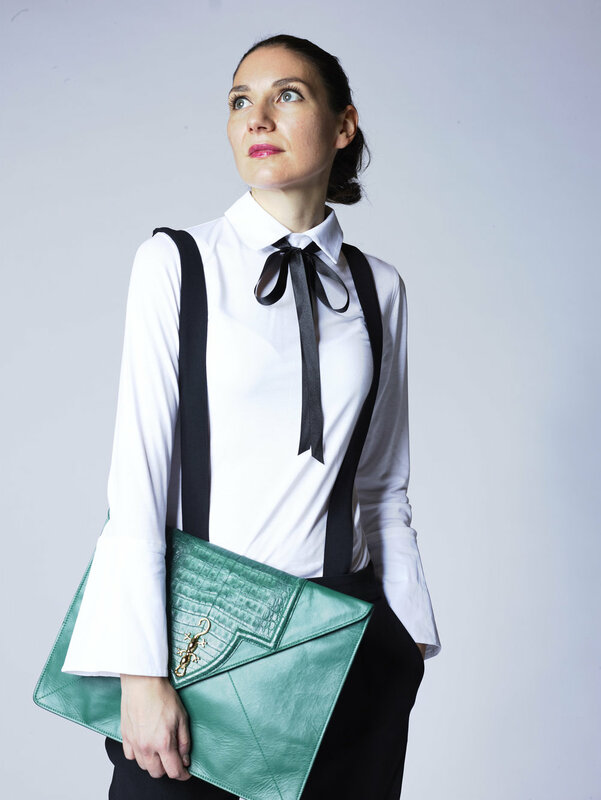 This gorgeous emerald green leather / crocodile oversize clutch is currently 50% off at £340 (Allie Maxi Clutch). And as you can tell from the pics below, it simply works with everything (casual, dressy, workwear...) and it also fits a laptop. Bingo! Wearing ME+EM shirt (Forever chic layering shirt, £79) and Sezane suspender trousers (sold out unfortunately but they have other styles still available...). So, tell me, which candy bag might you be tempted by...?